Saab Safari is a light, robust, single piston-engined, two-three seat aircraft with a structure of predominantly allmetal stressed-skin construction. As standard the aircraft is equipped with a tricycle landing gear. an airline pilot trainer for e.g. navigation system and airway procedure training. In addition to its primary role as a trainer the aircraft is also very suitable for utility operations such as carrying and dropping of relief and rescue packages from under wing stations. The aircraft is stable with great flexibility. Carl-Gustav von Rosen chose this aircraft for food dropping in Etiopia in the 1970s. The flying conditions were extreme with airstrips at 3 000 meters above sea level. It was after this operation the aircraft got the name Safari. The flexibility of the Saab Safari led to a development of a military version, called MFI 17 Supporter. The danish airforce chose in 1974 Saab Supporter as their new trainer and bougth totally 32 aircraft. The most successful export was the same year when the Pakistani airforce ordered 39 aircraft. This order was followed by a licensed manufacturing of the Saab Supporter in Pakistan, under the name Mushshak, and up until now 450 aircraft has been manufactured. 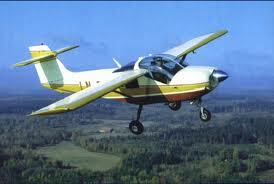 The Pakistani aifrorce developed a Super Mushshak with a stronger engine and a three blade propeller. Other export customers was the Norwegian airforce that bought 16 aircraft and Zambia airforce that bought 20 aircraft.